From The Creators of "Stomp,"
Following up the global success of their unique take on rhythm and physical theater, "Stomp" co-creators Luke Cresswell and Steve McNicholas have taken their concept to a new level with "Pandemonium: The Lost And Found Orchestra," coming to Boston as part of a North American tour. The production will play five performances at the Citi Performing Arts Center Wang Theatre, October 21 - 24. Where "Stomp" created rhythm with everyday objects, "Pandemonium" transforms everyday objects into a plethora of invented instruments. Performed by the LFO (Lost and Found Orchestra), "Pandemonium" recreates every section of a symphony orchestra, using musical saws, bottles, whirly toys and traffic cones. Out of chaos is found an orchestra. Reworked for 2010 with a dazzling array of homemade instruments, a 25-member mix of veteran "Stomp" performers, classical musicians, physical comedians and aerialists, "Pandemonium" climaxes with the human voice being added to the mix: what begins with simple melodies plucked, blown, thumped and brushed into life ends in a complex symphonic and choral celebration. In each city a 30 member local choir will contribute vocals. Luke Cresswell serves as onstage conductor of the 50-plus member company and will perform in "Pandemonium." The production came about as a result of Luke Cresswell and Steve McNicholas being approached by The Brighton Festival (UK) who commissioned the two to create a new work for its 40th anniversary. In only six months, instruments had to be invented and reinvented from scratch, and an entire score composed. 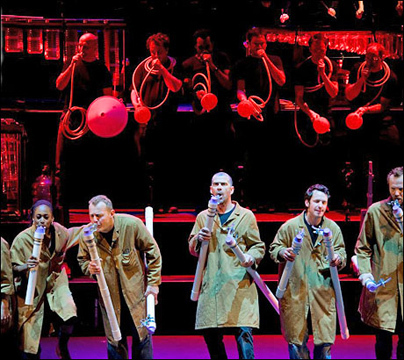 With the help of a crew made up of experienced "Stomp" personnel, expert instrument designer Paul Marshall advising, and with UK musicians who were prepared to abandon their instruments and learn how to play saws and hose pipes, LFO premiered there in May 2006. Since then LFO has broken box office records at Sydney Opera House, and played extended runs at London's Royal Festival Hall and Amsterdam's Carre Theatre. The Daily Telegraph called "Pandemonium" "A joyful celebration of the power of noise and human invention" while The Independent dubbed it "A celebration of energy, rhythm and inventiveness." By coincidence, next year will mark the 20th Anniversary of the first "Stomp production;" it has been running in New York for 16 years and in London for eight years. For tickets and information, stop by the box office on Tremont Street, call 866-348-9738 or visit www.citicenter.org.